Aspartate racemases distribute and function to produce d-aspartate in eubacteria, archaea, invertebrates, and vertebrates. The aspartate racemases of eubacteria and hyperthermophilic archaea are pyridoxal 5′-phosphate (PLP) independent, and two conserved cysteine residues constitute the catalytic center. The crystal structure of the aspartate racemase of hyperthermophilic archaeon was determined. Based on this structure, the detailed reaction mechanism of the pyridoxal 5′-phosphate-independent aspartate racemase was studied by characterizing mutants and molecular dynamics simulations. However, it is still unclear how the catalytic cysteine residue can abstract a proton from the α-carbon. 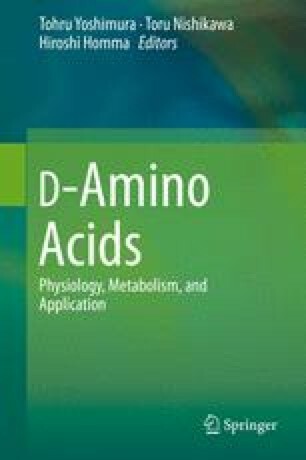 The aspartate in hyperthermophilic archaea is highly racemized, but the physiological role of aspartate racemase and d-aspartate in hyperthermophilic archaea is unknown. The aspartate racemases in invertebrates and vertebrates are PLP dependent. The aspartate racemases from invertebrates, bivalves, and Aplysia californica are homologous to serine racemases, but it has taken many years to identify the aspartate racemase responsible for the synthesis of d-Asp in mammals due to the lack of other amino acid racemases. The gene for the mammalian aspartate racemase was obtained via its homology with glutamate-oxaloacetate transaminase. Further studies on aspartate racemase will promote research on the mysterious functions of d-Asp in various organisms.